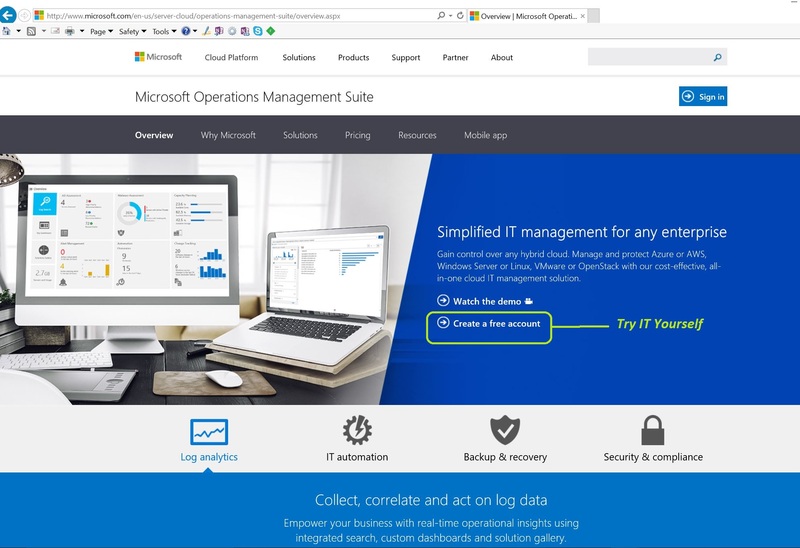 The OMS Log Analytics Forwarder enables customers to have their OMS managed devices (Windows and Linux) to send data to a central server which has access to the internet. OMS Log Analytics Forwarder is a HTTP forward proxy that support HTTP tunneling via HTTP CONNECT command. 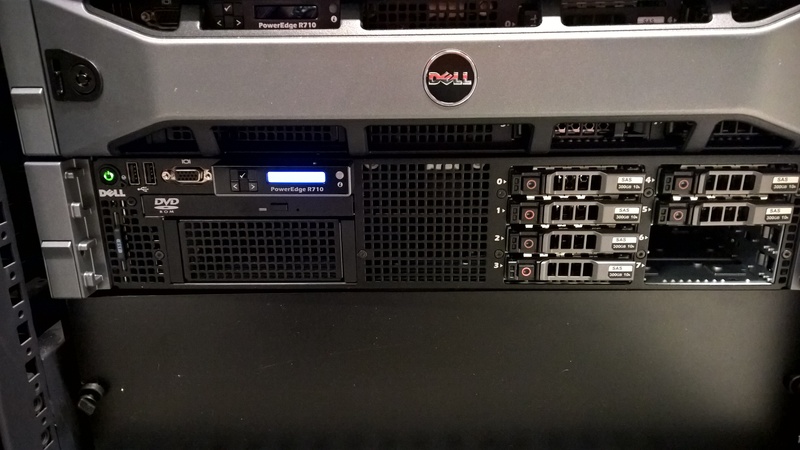 The Forwarder can handle up to 1000 OMS concurrent connected devices if run on a 4 core CPU, 8GB Windows Server with a 1Gbps network connection. 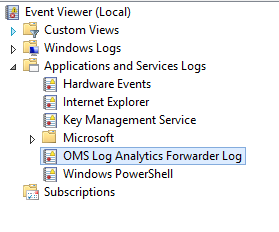 In order to use the OMS Log Analytics Forwarder, you need to install the OMS agent on the Forwarder Server. Categories: Azure, Linux, Microsoft Azure, OMS, SCOM2012, SQL, System Center 2012 R2, System Center 2016, Windows Server 2012 R2, Windows Server 2016, WindowsAzure, WindowsAzurePack | Tags: Azure, HybridCloud, HyperV, Linux, Management, MSOMS, OMS, SQL | Permalink. 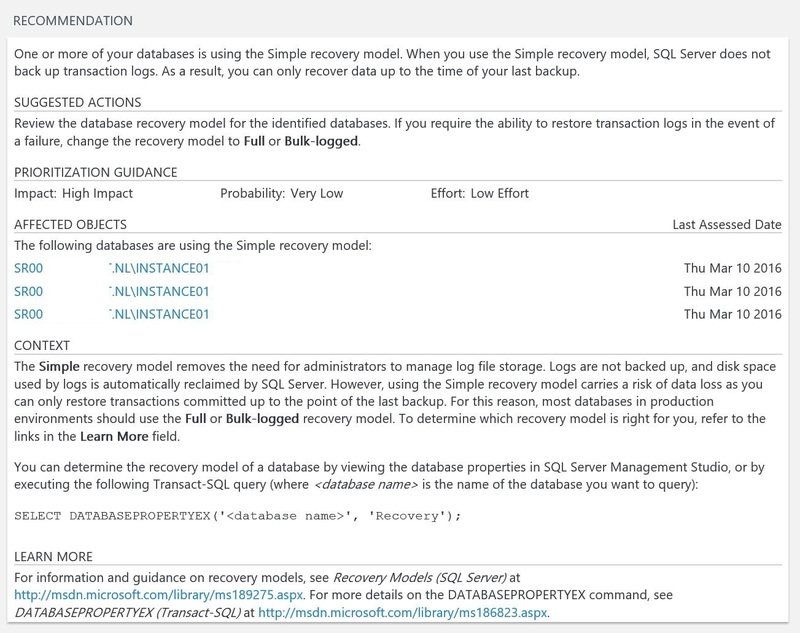 Microsoft Operations Management Suite (OMS) SQL Assessment to see if your SQL Solution is installed and Configured well. 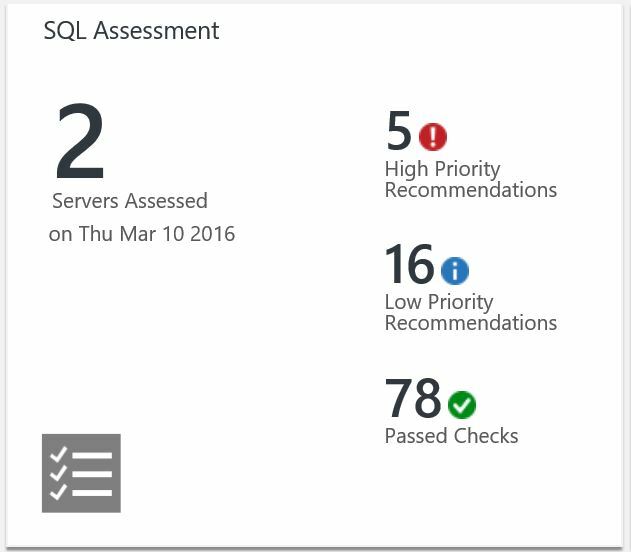 When the SQL Assessment Solution is activated, It can take a while because the assessment has to collect data of the SQL settings. 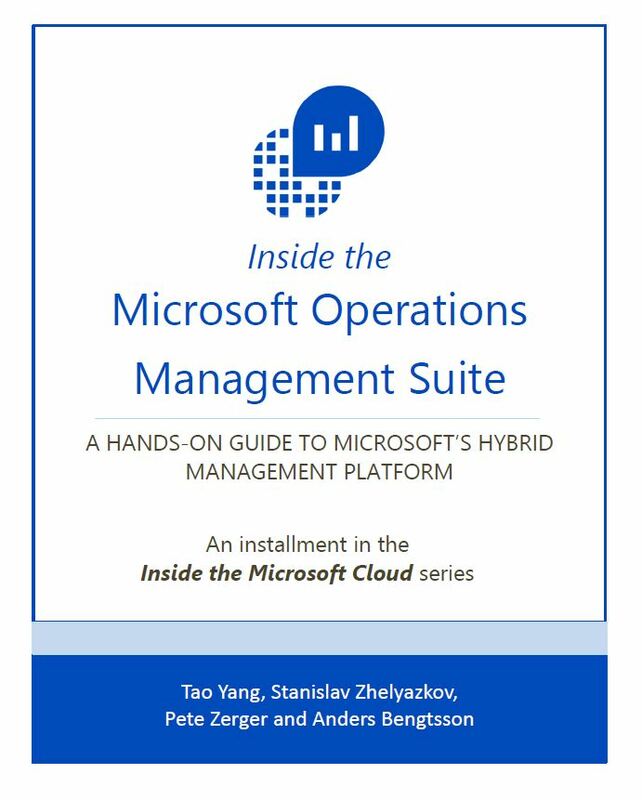 Categories: Azure, Azure Security, Azure Stack, Linux, Microsoft Azure, OMS, SQL, WindowsAzure | Tags: Azure, Cloud, HybridCloud, Management, MSOMS, OMS, SCOM, SQL, SQL2016, sysctr | Permalink. Sign in as a service administrator and create a plan that includes the compute, network, and storage resource providers. This will give subscribers to the plan the ability to provision virtual machines. 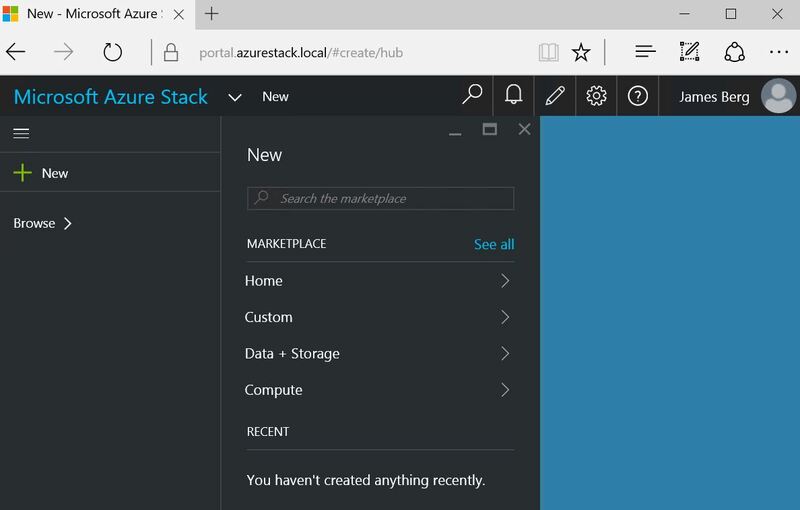 In an internet browser, navigate to https://portal.azurestack.local. 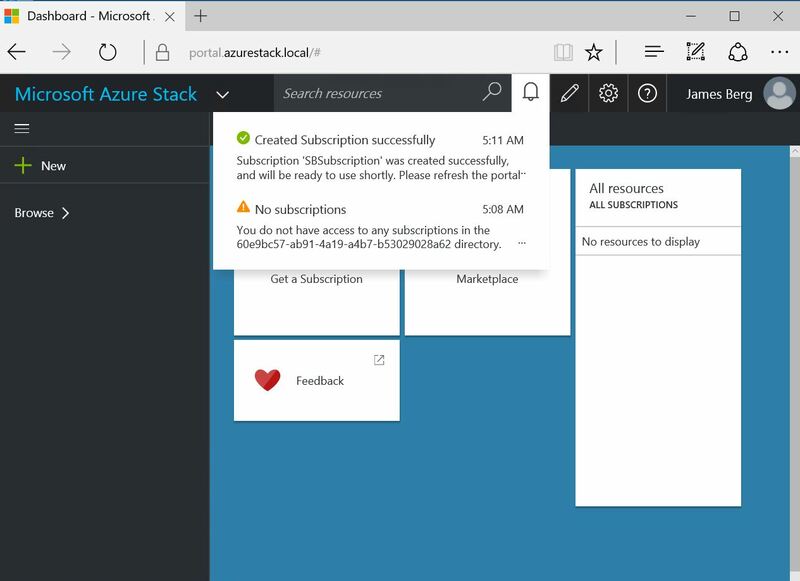 Sign into the Azure Stack Portal as a service administrator and enter your service administrator credentials (this is the account created during step 5 of the Run the PowerShell script section in part 1), and then click Sign in. Service administrators can create offers and plans, and manage users. To create a plan and offer that tenants can subscribe to, click New. 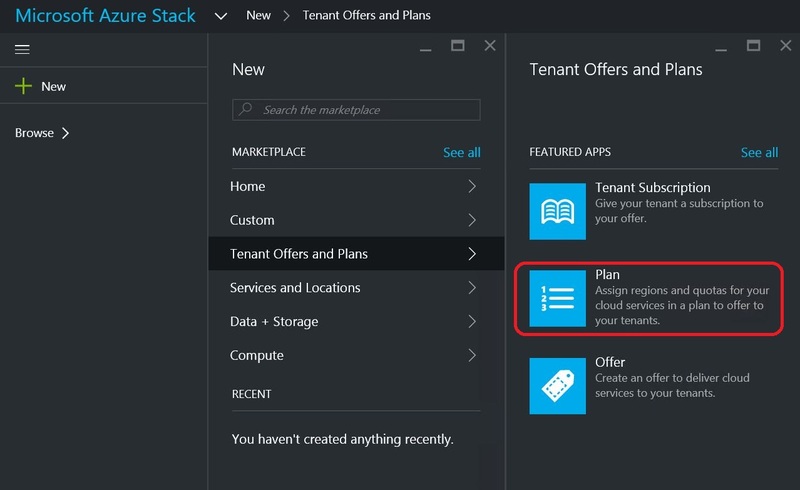 In the Create blade, click Tenant Offers and Plans, and then click Plan. Fill in Display Name and Resource Name. The Display Name is the plan’s friendly name. Only the admin can see the Resource Name. 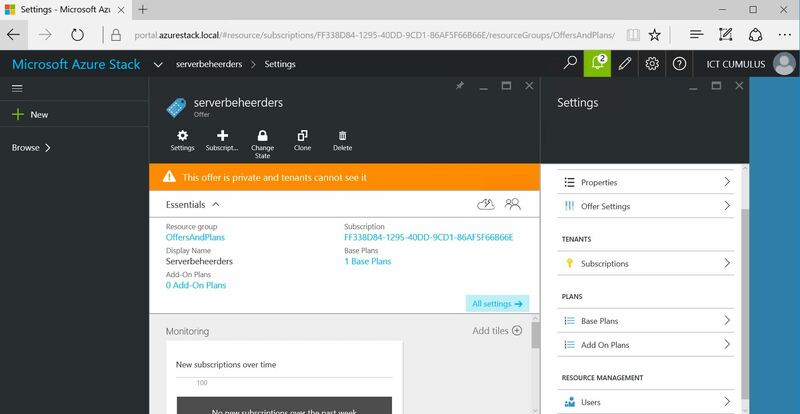 It’s the name that admins use to work with the plan as an Azure Resource Manager resource. 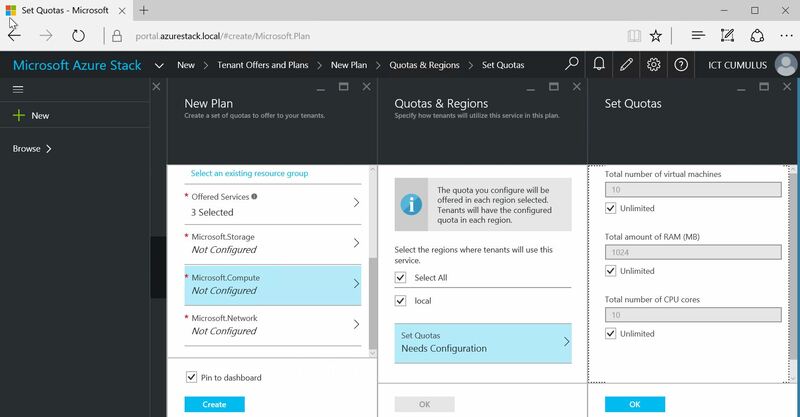 Select or create a new Resource Group as a container for the plan. By default, all plans and offers will go into a resource group called OffersAndPlans. Click Offered Services, use the Shift key to multi-select all three providers (Compute Provider, Storage Provider, and Network Provider) and then click Select. Click Compute, and then click Needs Configuration. 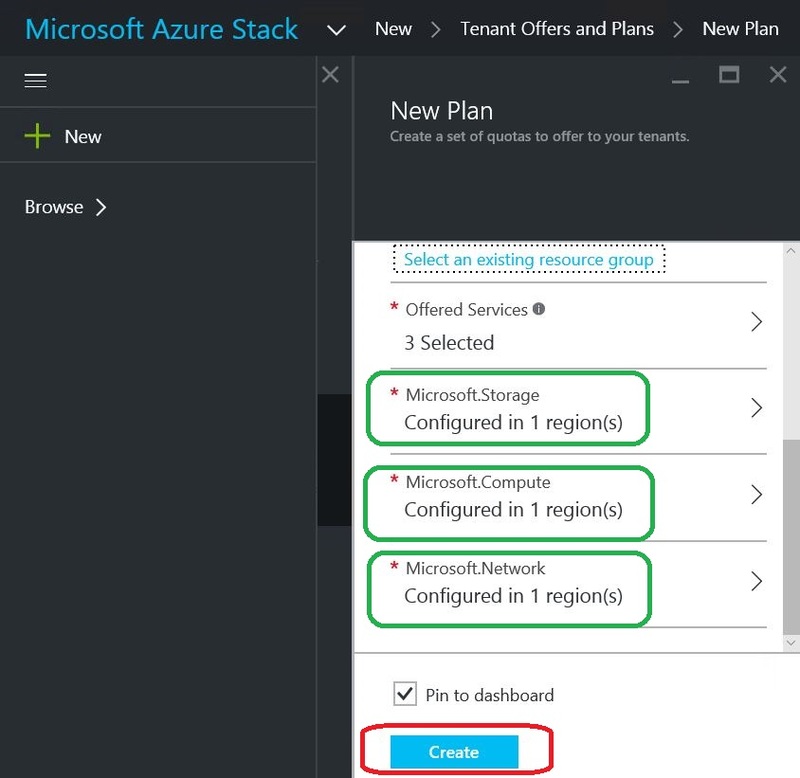 Click on Create to make the Azure Stack Plan. The New Plan “Serverbeheer” is made. 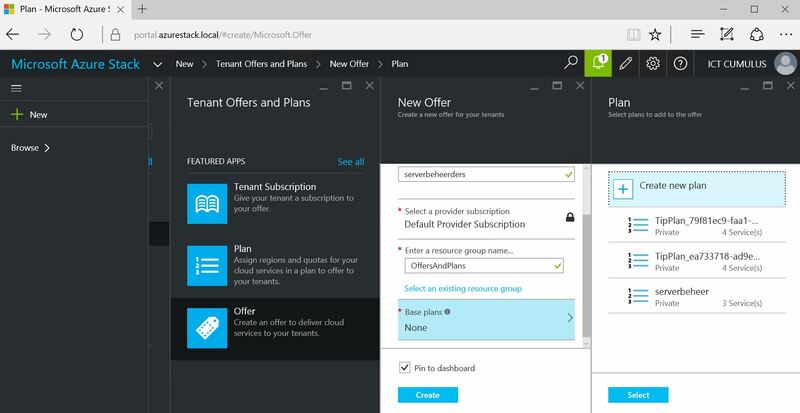 Now you have an Azure Stack Plan, you can Create an Offer for the Tenant so they can get a Subscription. Log in to the portal as a service administrator. 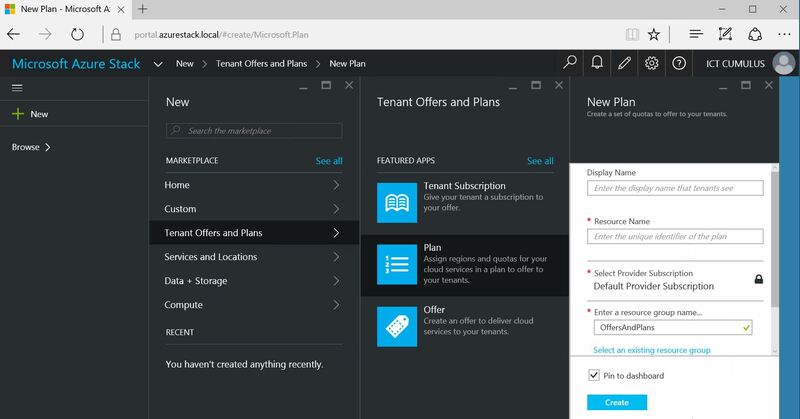 Click Tenant Offers and Plans, then click Offer. Fill in Display Name and Resource Name. The Display Name is the offer’s friendly name. Only the admin can see the Resource Name. 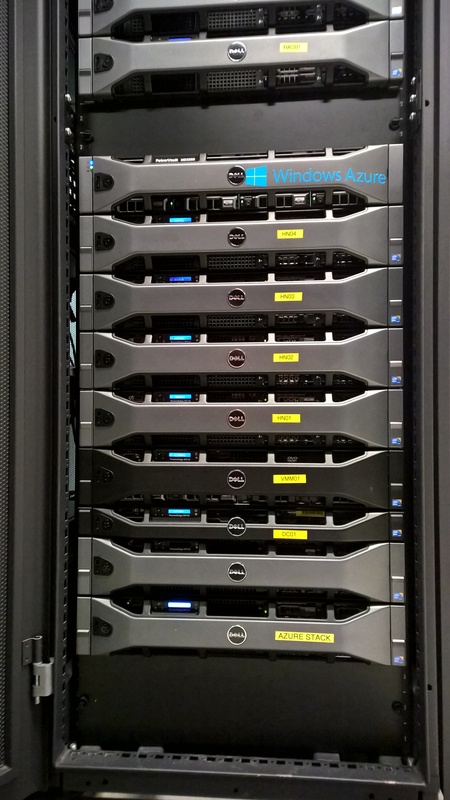 It’s the name that admins use to work with the offer as an Azure Resource Manager resource. Select a new or existing Resource Group. Select your plan and Click on Create. Private: Only visible to the service administrators. Useful while drafting the plan or offer, or if the service administrator wants to approve every subscription. Decommissioned: Closed to new subscribers. 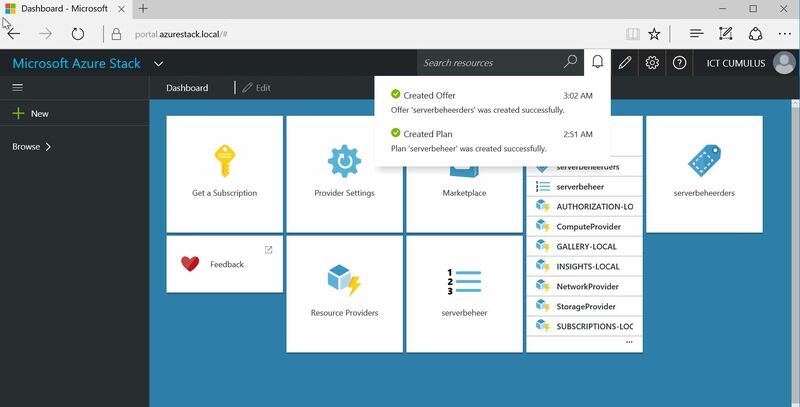 The service administrator can use decommissioned to prevent future subscriptions, but leave current subscribers untouched. 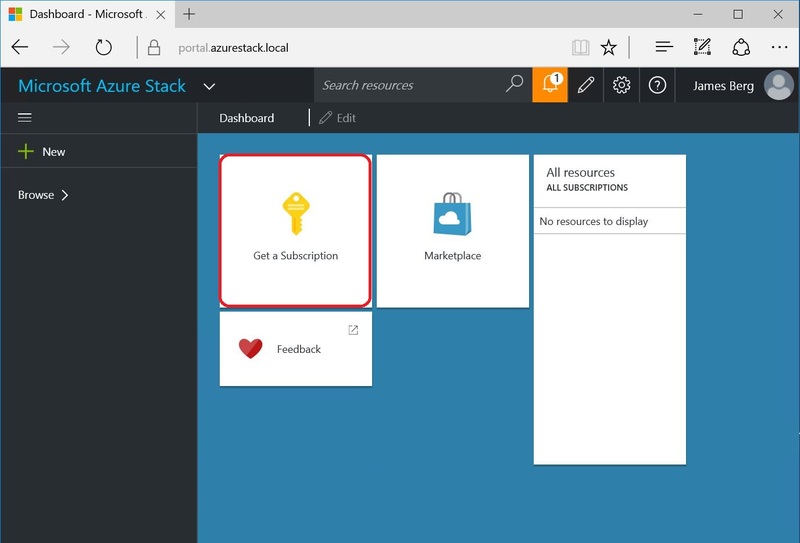 Your Microsoft Azure Stack Plan and Offer are now Created. Changes to the plan or offer are not immediately visible to the tenant. To see the changes, the subscription state must be InSync, then the tenant must refresh the portal or login/logout. Even after an additional subscription has been created and is InSync, you might have to logout/login to see the new subscription in the “Subscription picker” when creating new resources/resource groups. 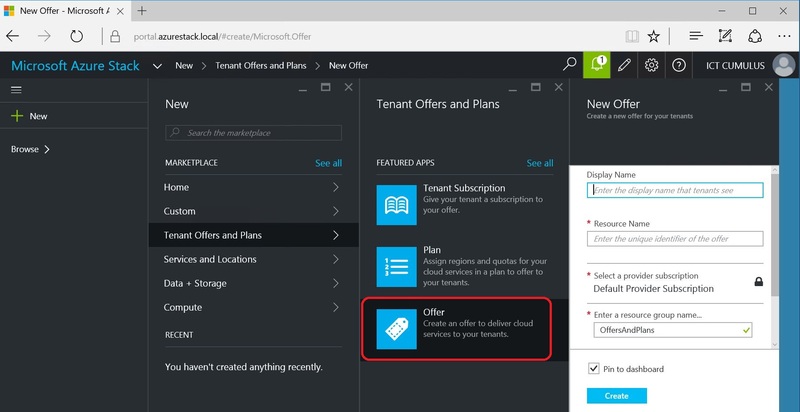 First you need your Tenant Accounts from Microsoft Azure. You must have an Azure subscription to use the Azure portal. In Microsoft Azure left navigation bar, click Active Directory. 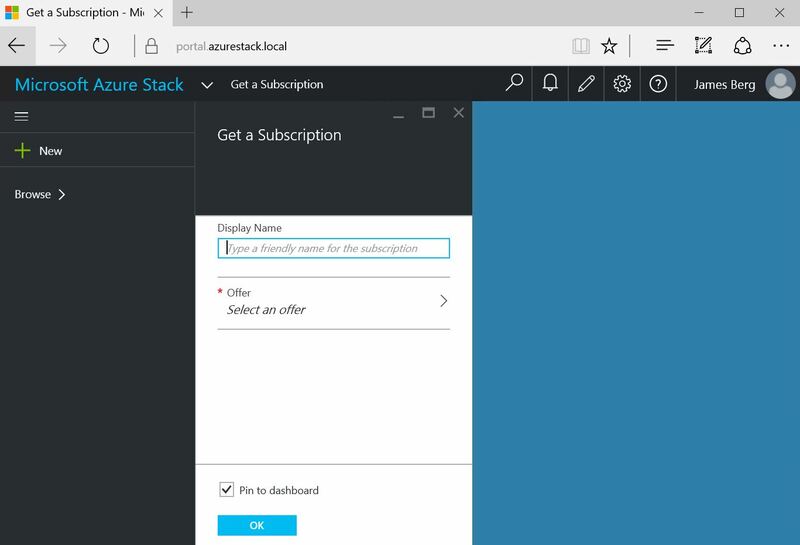 In the directory list, click the directory that you want to use for Azure Stack, or create a new one. On this directory page, click Users. In the Add user wizard, in the Type of user list, choose New user in your organization. In the User name box, type a name for the user. In the @ box, choose the appropriate entry. In the User profile page of the wizard, type a First name, Last name, and Display name. In the Role list, choose User. On the Get temporary password page, click Create. 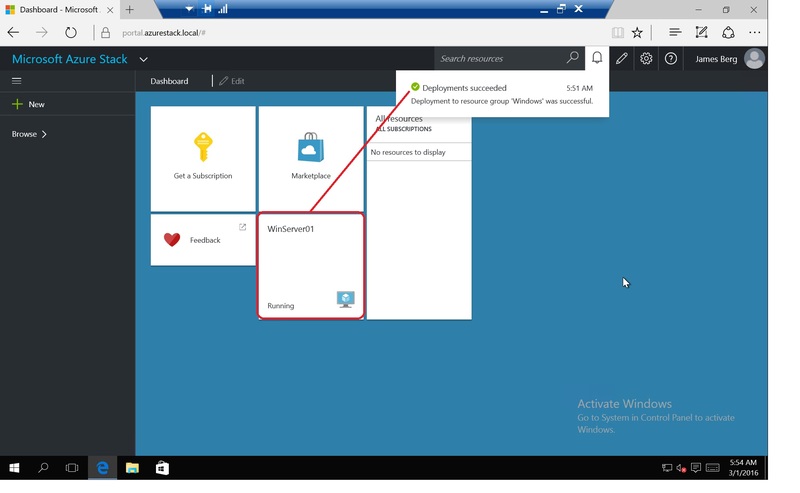 Log in to Microsoft Azure with the new account. Change the password when prompted. 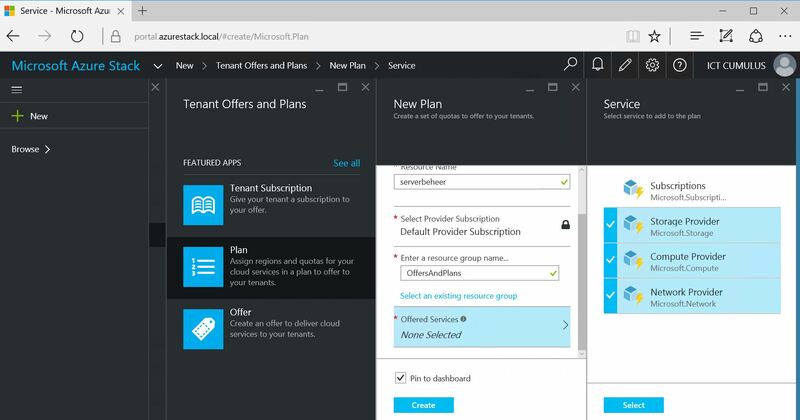 Log in to https://portal.azurestack.local with the new account to see the tenant portal. In the Display Name field, type a name for your subscription. Click Offer and verify that the offer you created is in the Choose an offer Click that offer, click Select, and then click OK.
After you subscribe to an offer, wait until the subscription state is InSync. Then refresh the portal to see which services are part of the new subscription. 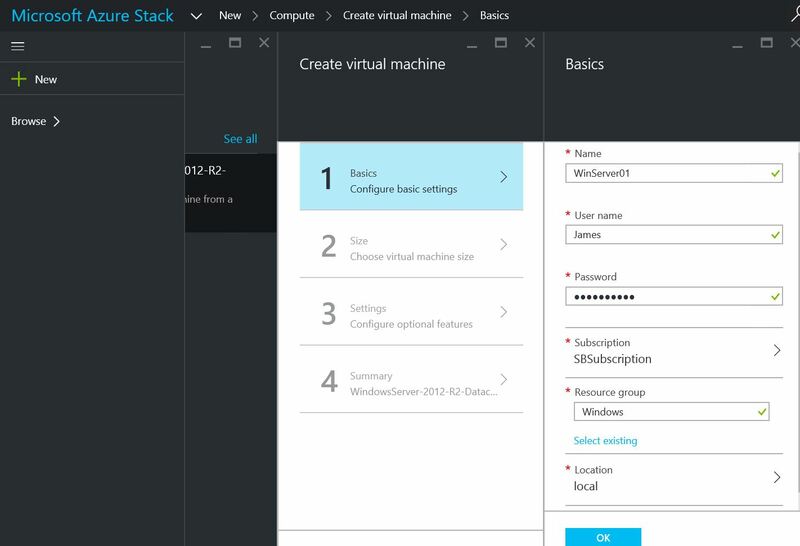 Categories: ARM, Azure, Azure Security, Azure Stack, CPS, Microsoft Azure, Windows Server 2012 R2, WindowsAzure, WindowsAzurePack | Tags: Azure, AzureStack, Cloud, HybridCloud, Linux, Microsoft, MSOMS | Permalink.